Buffalo Creek still filled high with ice in West Seneca. Resident on School Street watching for more ice jam flooding. 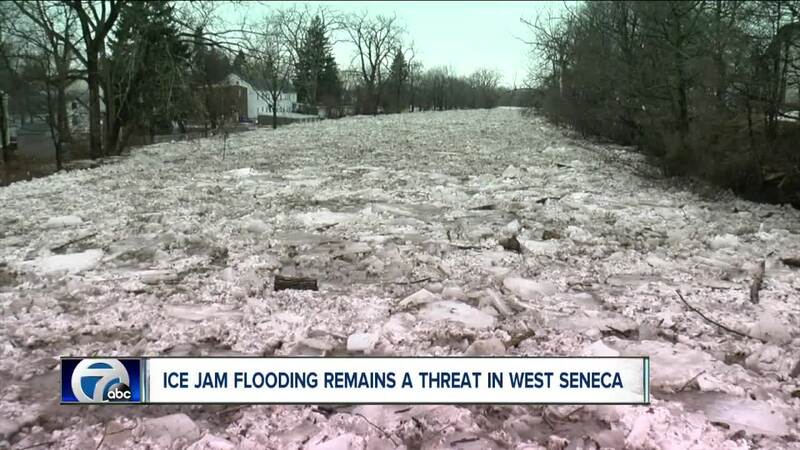 WEST SENECA, N.Y. (WKBW) — Several people are now displaced from their homes in West Seneca after ice jam flooding forced them to flee on Monday evening February 4th. 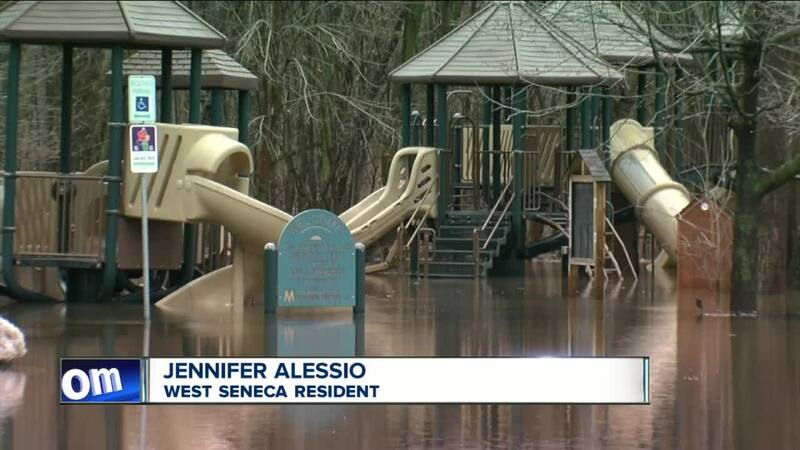 Ice jam flooding also swamped the Charles E. Burchfield Nature & Art Center where people and children had to run for their lives as water rushed into the park, said West Seneca Town Councilman Gene Hart. West Seneca Supervisor Sheila Meegan appeared live on Eyewitness News at Noon to give an update on the situation. Because electric and gas utilities were turned off for flood-affected buildings in School Street, Supervisor Meegan said the town will call people when it is safe for them to return. 7 Eyewitness News Reporter spoke with several people impacted by the flooding. You can hear their comments in the attached video clip. BUFFALO, NY, Tuesday, February 5, 2019— Volunteers from the American Red Cross will be opening a shelter in West Seneca for residents displaced by flooding in the area. The shelter will be located at Union Fire Company District #2, 1845 Union Road, West Seneca, NY, 14224. Volunteers will offer a warm place to stay, food and water, comfort and support. Affected residents are encouraged to take advantage of the services being offered at the shelter regardless of whether they have other lodging arrangements. The American Red Cross urges area residents to take steps now [redcross.org] to prepare for potential flooding. Prepare an emergency preparedness kit. Replenish any items missing or expired, especially medicines or other medical supplies. Keep it nearby. Create a household plan and practice it. Be prepared to evacuate quickly if directed and know your routes and destinations. Listen to local area radio, NOAA radio, or TV stations for the latest information and updates. • Avoid already flooded areas and areas that are subject to sudden flooding such as dips, low spots, canyons, washes etc. Stay away from rivers, streams, creeks and storm drains. • The National Weather Service reports that nearly half of all flood fatalities are vehicle related. Do not attempt to cross flowing streams or water covered roads. • If caught in a flash flood, try to get to higher ground and stay there. Just six inches of fast-flowing water can knock you over and two feet will float a car. • Turn around and find another route if you come upon floodwater, rapidly rising water or barricades. Barricades are put up by local officials to protect people from unsafe roads. Driving around them will put you and your vehicles occupants at serious risk. • Don’t allow children to play in or near flood water. It may be contaminated with sewage. • Turn off the power and water mains if instructed to do so by local authorities. • Boil tap water until supplies have been declared safe. • Avoid contact with floodwater. It may be contaminated with sewage. • Continue listening to local area radio, NOAA radio or TV stations for the latest information and updates. • Don’t use gas or electrical appliances that have been flooded until after they have been checked for safety. • Dispose of any food that has come into contact with flood water.